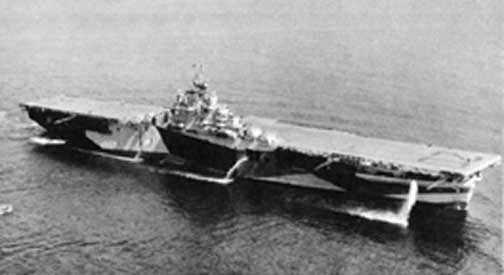 the aircraft carrier that my Dad had served on in WWII. Nothing was found by the time my parents had to go back home. Oh, oh... now it was a matter of honor! Company Gone...Back on the net...on with the search! He found a picture of the "Benny" picking up one of the Apollo Spacecraft Crews in the late sixties. for framing. Shouldn't be too difficult... He could get it by Christmas... No sweat! And what a great Christmas present it would be! The Bennington Museum, Bennington, Vermont. Hmmmm, let's try that! on getting a picture of the USS Bennington. honoring her and her 51st reunion. But most important, included in this "package"
who has access to a great quantity of memorabilia. that he had some artifacts that might be of interest to us. you talk to for a few minutes you feel you have known them all you life. who now helps with the reunions, and sells logo items for the Bennington enthusiasts. on the Benny during WWII. He kept track of all the guys that attend the reunions. there was a shipmate living in Stoughton, and he'd include his address in the package! Another link back to the past. was a neighbor of ours, right over on the next street! who was also a plank owner, and the CIC officer on the Bennington. Dad's Birthday (his 80th) had arrived, and the whole family travelled to Wethersfield, Conn.
with the new friends he made because of the "Quest". What a wonderful thing the Internet is! He was a Communication's Officer on the "Benny". And if you have any more links I can add about the Bennington! Thanks!